The Cala (‘cove’ in Italian) is one of those places in Palermo that I really love. 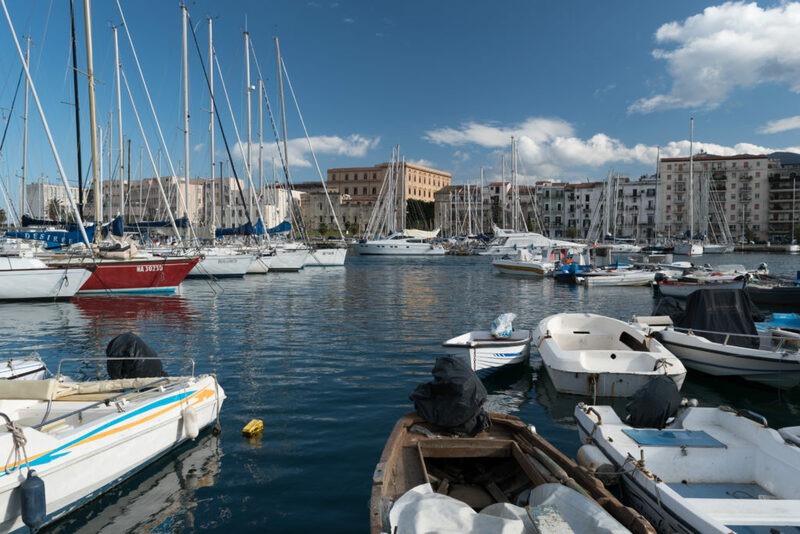 Historically, it has been the first harbour of Palermo and probably the reason why the city was born. Natural cove in which the two rivers Kemonia and Papireto used to meet, the Cala had been chosen by the Phoenicians about 2800 years ago because of its strategical potential. From there the Cassaro spread, a straight road that still now represents one of the main axis of the historical city centre. Nowadays the Cala is the marina of Palermo, restored and given back to the people of Palermo and unfortunately always surrounded by the urban traffic. In fact, the noise of traffic is so strong that very often those pleasurable sound that are typical of harbours disappear, too soft to be noticeable. Nonetheless, if you get a bit nearer to the boats, when the wind blows softly, you can hear their sweet lapping, the sound of ropes that stretch and relax, the dart of fishes in the water and, from time to time, a boat passing by..